SR1 Software calculates, in accordance with VDI 2230, high-stress bolted joints with concentric or eccentric strain and load. The calculation makes enables graphical representation of load-extension diagrams and scale drawings. Quick input provides input of all data in only one dialogue window. Click "Calc" button for bolted joint calculation and get result as desired at "Display" (tables, drawings, diagrams). Different combinations of bolt diameters/strength classes are calculated from the input of concentric/eccentric axial force or shearing force, static/dynamic load and tightening method which are then used as a basis for more detailed calculation. You can choose any of the following items from the database: shank and waisted bolt dimensions according to ISO, as well as metric standard and fine threads, bolt heads in accordance with ISO 4762, ANSI B18.3, ISO 4014, ISO 4017, ANSI HEX, ANSI HEAVY HEX, ISO 10642, IFI 536, IFI 538, EN 1665, twelve point flange bolts, and nuts in accordance with ISO 4032, ISO 4034, ANSI1, ANSI2 and ANSI HEAVY. The data base files may be appended and altered as you require. Alternatively, you can also define any number of special stepped bolts. Additional data base files and corresponding drawings are available for fasteners still commonly used in the United States with inch ( English ) thread dimensions. While the data base information is provided for diameters and pitch combinations (threads/inch) all dimensions in these data base files have been converted to SI units, i.e. 1.00 inch = 25.4 mm. and Ksi stress factors are converted to N/mm². You can freely define the dimensions, material, E-Modulus, and permissable pressure of up to 20 clamping plates. The database can be appended to include additional materials, E-Modulus, and permissible pressure information to meet the needs of the user. 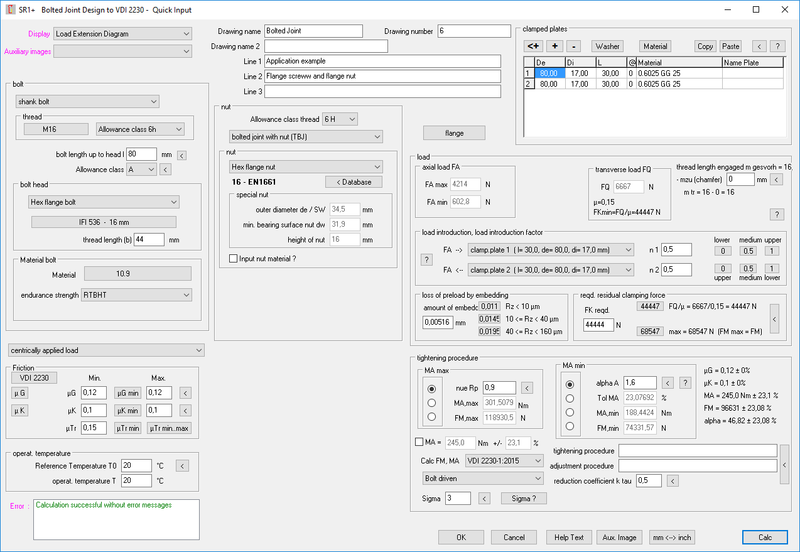 The experienced user can create special effects with clamping pieces to modify the SR1 deflection calculations to supplement FEA calculations and Torque / Angle Signature measurements. SR1 calculates bolted joints with concentric and eccentric strain and load. The most important friction coefficients for thread, head seat and seam are available for use in the integrated data base. The friction coefficient data base can be appended by the user to include new combinations of materials. Friction coefficients can be determined experimentally by fastener research test machines such as the R S Technologies LabMaster Model 9504 which performs tests according to DIN 946. The slope, R_MA: Nm/degree of the Torque / Angle Signature for a given bolted joint can be used to help verify the uniformity of friction effects . Actual experience has shown that it is very important to test all combinations of lubricants , plating and coatings to verify the uniformity and reliability of the friction coefficient data. In practice it is not uncommon to see variations of 2:1 in the friction coefficients as fasteners are repeatedly tightened and loosened . Material specifications must be made to minimize such variations. Clearly it is the responsibility of the user to know as precisely as possible the degree of reliability that can be assigned to his design assumptions. The SR1 program can provide important documentation for bolted joint designs where complete traceabilty is required according to ISO-9000. Tightening factor and tool precision discrepancies are available from the SR1 - VDI 2230 database. These are guidelines based upon actual experience and measurements made in the field. The individual user should independently verify the actual tightening results obtained for each specific assembly. The "Release Angle Method" provides the most reliable, practical means to verify the actual pre-load tension for a given fastener installation. It is important to note that SR1 and VDI 2230 are design guides which must be supplemented by experimental measurements to verify all calculations. Material strengths and friction coefficients and key dimensions must be documented to assure that actual practice corresponds to the design assumptions. M-Alpha Diagram and F-Alpha Diagram with torque and clamping force are displayed as a function of angle of turn starting at the "Elastic Origin". The "Elastic Origin" is located by projection of the tangent to the tightening curve at the pre-load point to the starting torque level. The starting torque level is "0" unless a prevailing torque such as is introduced by thread friction on a locking-nut or self tapping effort is present. The M-Alpha Diagram has been included / added to VDI 2230 SR1 analysis to provide a link to the powerful Torque / Angle Signature Analysis Methods developed by Ralph Shoberg of RS Technologies Ltd in the United States. The combined efforts of Fritz Ruoss of HEXAGON, and Ralph Shoberg of RS Technologies have added major practical elements to the already powerful tools of VDI 2230 analysis. Any one involved in the engineering, design, test, measurement and control of threaded fastener assemblies will find that the SR1 software is a "must have" tool . Professors, instuctors, students, and practicing engineers will find that the SR1 software is perhaps the best technical guide to engineering/design/analysis of bolted joints . With the SR1 you can evaluate all previous designs, and with past experience as a guide , use this information to assist in creating more reliable new designs. Load-extension diagrams for assembly status and working status can be displayed on screen and printed out on any Windows printer. Via DXF and IGES files you can transfer the files to CAD and DTP systems. All elastic compliances, forces, loads and tightening moments are calculated. The input and result data can be output to screen and printer, or saved file. SR1 generates a scale drawing of the bolted joint, showing bolt, clamping piece, nut or dead hole. Transfer of data to CAD is possible via DXF or IGES files. It is possible to call up the HEXAGON Help System with help text and pictures for all input data. When error messages occur you can have a description and solution suggestion displayed on screen. The extended version SR1+ calculates the maximum load for a single bolted joint from the flange forces, bending moments and torque. SR1/SR1+ is available as 32-bit or 64-bit application for Windows 10, Windows 8, Windows 7. HEXAGON guarantees, for a period of 24 months, that the software will fulfil the functions described. We constantly endeavor to extend and improve HEXAGON Software. We keep our customers informed about updates and new features at regular intervals. Additional technical support is available from RS Technologies who in partnership with HEXAGON can assist in training users as well as provide important consultation on questions regarding test measurements related to fasteners, assembly tools and bolted joint design. The "Student Edition" is the Demo Version SR1 which you may download at any time (www.hexagon.de/zip/sr1_e32.zip). No commercial use is permitted for the demo version. Educators who wish to use the SR1 software for engineering consulting must purchase a full- licensed copy of the program. Educational packages, licensed for teaching purposes only are Licensed to the individual educator and are available at a special price for teaching purposes only. A single University Laboratory or computer room can obtain a room-license copy of the SR1 program. All room licensed copies are identified with license serial number and include full operating features but are licensed for teaching purposes only . Updated material database for clamping plates (mat_p_2.dbf) and bolt material. Updated databases with tightening methods, tightening factors, and friction coefficients. Calculation of thread strip safety according to new VDI 2230-1:2014. Input and calculation of additional bending moment MB for eccentric load. Extended calculation and diagrams for over-elastic tightening (yield point overriding). New diagram p=f(x) with distribution of pressure in the interface. Calculation of elastic resilience by means of deformation cones according to VDI2230:2014, or with deformation cylinders according to VDI 230:1986 (configurable). Download Powerpoint Presentation "Introduction to VDI 2230 (by RS Technologies)"